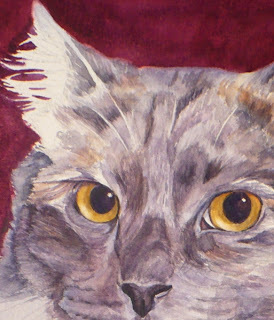 The cat who posed for this portrait is just delightful. There were so many fun photos sent by the client that it was tough to chose which one to use! I finally decided on a head and chest pose in order to focus on her incredible eyes. To start, I painted the background a deep burgundy as that was one of the colors the client suggested. If the background colors are in first, I can adjust the mixed grays of the cat to go with the background much better than if I'd waited to put it in last. Normally I don't do the eyes right away, but these eyes were just too hard to resist! Right now she reminds me of an owl! 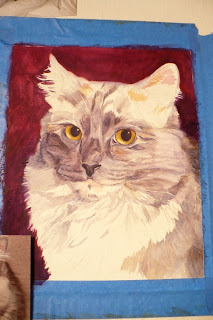 Next, I start to carefully paint in the gray fur. 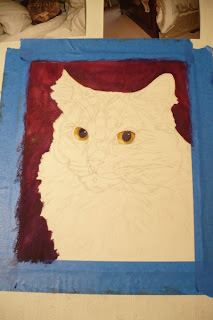 Before beginning the painitng, I did a very careful and detailed drawing making sure all the planes of the cat's face were drawn in. The planes are small flat sections that together make up the shape of the face. The detailed drawing makes it easier to paint, because when the planes are marked, I can work on one small section at a time. If you click on the picture, you can get a closer view of the colors I used to make the gray and how the varying shades show the planes of the face. Some of the fur looks more blue-gray, some pinky-gray and some brown-gray. The cat's fur has color variations, also the light changes the color depending on how it falls on the fur. For this portrait, the side of her face receiving more light is warmer and brighter, the shadow side is cooler with more blue color. Below is the finished piece with details added. Here is Lily. Isn't she pretty? 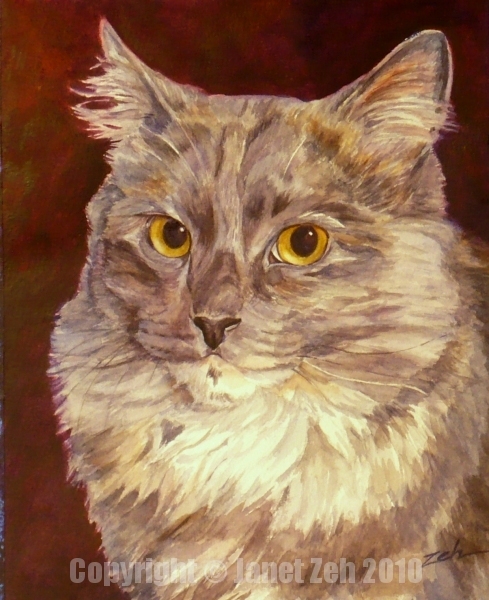 Do you have a precious cat you'd like painted? Check out the details here, ZehPetPortraits.com or contact me. you did a great job on lily's portrait, so detailed and expressive, love the background too, it compliments lily very well. Thank you ivana. I'm so glad this portrait turned out well. I hope the people who receive it as a Christmas gift will like it too!